Attention folks! The Xperia TL is here! The latest from Sony, this phone encompasses a range of features designed to give users a fulfilling mobile experience. With a 1.5 GHz dual core S4 processor and enhanced camera clarity, the Xperia TL is full of functionalities and is designed to meet the pocket of even the average buyer. In terms of quality and affordability, the Xperia TL is right up there with HTC’s One X and Samsung’s Galaxy S3 (may be a better deal than the latter!). With the handy device all set to make its presence on the big screen in James Bond starrer, Skyfall, there is actually something interesting for secret agents as well! The Xperia TL kit contains: a microUSB cable, Quick Start manual, charger, and an exclusive Xperia SmartTag. Don’t be surprised if this smartphone isn’t familiar to you! It is nothing more than a rebranded Sony Xperia T – in AT&T’s lineup, to be more specific. The arched back outer casing stands apart from most smartphones, the overall design is pretty much Xperia-like but is a lot clearer. The modest size, clean look, solid design, and the aluminum rear casing – all give a clean look. Sony opts for Android buttons rather than the conventional capacitive buttons – which of course is a modern trend with most of the Ice Cream Sandwich devices. We hear that the camera shoots at a fair resolution of 720p with its 1 MP front-facing camera. Also, we were able to find a tiny earpiece and LED notification on the front end. The device also has provisions for regular add-ons such as: microUSB cable port for charging and data transfer purposes, a noise-curbing mic, a power button, a 3.5mm headset jack, volume control button, and a shutter key. 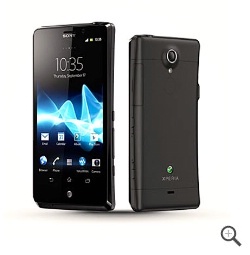 Sony Xperia TL has a 13 MP digital camera - the resolution is far ahead of most of its competitors in the market today. In addition to the high-quality resolution, the camera is also comprised of a range of photographer-friendly options such as: Autofocus, LED flash, front-facing camera, Digital zoom, and video recorder. The Xperia TL is equipped with a 4.55” screen – which is almost 23% bigger than most average smartphones in the market today. Moreover, the handy device also encompasses some mouth-watering features like extra display support, multi-touch capability, ambient light sensor, proximity sensor and scratch-resistant outer cover. The Xperia TL is available at $99 on a 2-year contract with the respective carrier. The cost is 1% less than what is offered by the average smartphone providers. Though the phone is comparatively low-priced, we felt the software is still outdated and the processor is sluggish – only to hold it back from achieving great heights. However, the other features are good – the quick access to 4G LTE, longer battery life, the user-friendly design, style, improved camera resolution etc. We think Sony Xperia TL deserves applause! Kudos! This is a guest post by Sofia Fern. She is a guest writer who writes more about digital cable and high speed internet. Get more information about cox cable today.